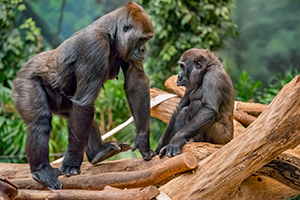 This spring, the Association of Zoos and Aquariums (AZA) is hosting Gorillas on the Line, a cell phone collection drive to benefit gorilla conservation. 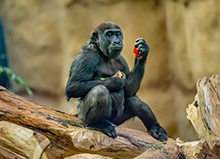 The Gorilla Species Survival Plan (SSP®) and World Gorilla Day are coordinating it in conjunction with Eco-CELL, and the Milwaukee County Zoo is participating! The campaign goal is to reach 10,000 people with the message about gorilla conservation, and to collect 10,000 cell phones for recycling. WHAT can we recycle through this collection? Handheld devices, such as cell phones, digital music players, and tablets. WHY should we recycle these devices? Handheld devices contain coltan, a mineral mined in gorilla habitats in Africa. Recycling these devices and reusing the metals reduces the need to mine for coltan, thereby helping preserve the habitats. Phones recycled through Gorillas on the Line will also generate funds for gorilla conservation. WHO can host a collection? Besides the Zoo; schools, businesses, and groups who want to participate can designate a site coordinator and have them contact Kari Williams for details. May 3 to be counted for this challenge. WHERE should we bring old phones to be recycled? Individuals can bring their phones to the Zoo and put them in the collection bin in the U.S. Bank Gathering Place as usual. Phones deposited during the drive will be included in this challenge. Schools, businesses and organizations who choose to participate can host a collection at their own site, and ship collected devices directly to Eco-CELL at the end of April. Talk to your friends and family, and encourage them to recycle any old handheld devices they have. And offer to bring those phones to the Zoo with you! If you have a contact at a local business that you believe would be willing to host a collection, email Kari Williams to discuss. The Milwaukee County Zoo would like to thank you, in advance, for answering the call! This campaign is being led by the Gorilla Species Survival Plan and World Gorilla Day. You can recycle your mobile phone at the Milwaukee County Zoo every day of the year, but only those submitted to Eco-Cell by May 3, 2019 will count for this campaign.